Black bean sauce is always very tasty. This recipe is very simple and common. I've done it like in the restaurant, the meat is marinated in baking soda and velveted in hot oil before stir fry to ensure the meat is very tender. Colourful and tasty simple dish. Mix the pork with bicarb, oyster sauce, leave to marinate for 30 - 40 minutes. Stir in the cornflour. Heat the oil in a wok till very hot, turn the heat to maximum, throw in the meat, it will sizzle like mad, stir and loosen the meat to cook in the hot oil. Take the meat out after 1 minute. Drain using a large sieve. Remove all the oil but leave about 1 tbsp, add in the chopped garlic and chilli, stir then add the black beans, stir till fragrant. Add in the meat and the sweet pepper, turn the heat to maximum, stir then add in some cooking wine, black soy sauce and a little sugar to balance the saltiness. Stir till pepper is tender but still have a bit of crunch. Add in the spring onion stir and ready to eat. ** Velveting this way the meat is very tender. You can reuse the remaining oil. 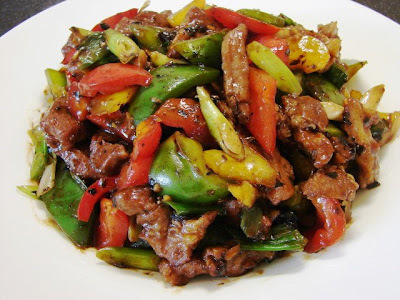 If you don't like the idea of cooking the meat in hot oil, you can stir fried raw with the garlic, chilli and black bean till nearly cooked before adding the pepper. *** You can also substitute pork with chicken or beef. If using chicken omit bicarb and add about 1 tbsp beaten egg white. Thanks again for the beans, I made a quorn dish last night, using your pork and pepper recipe. I change it a little, such as adding only a little red pepper, spring onion and oyster mushrooms. As I only have sugar cubes, instead of soy sauce I used ketjap manis for the sweet and salty flavour. It was huge success, and the beans just give it that true authenticity, my Chinese dishes always lacked. What is bicarb? Is it the same as baking soda? Sorry for the late reply, I haven't been online. Bicarb is baking soda.